Just look at that beautiful tropical flower. One might think I was showing you photographs from a recent trip to Hawaii, but I’ve never been there. Nope, I took this photo in my backyard and it represents a major gardening triumph for me. 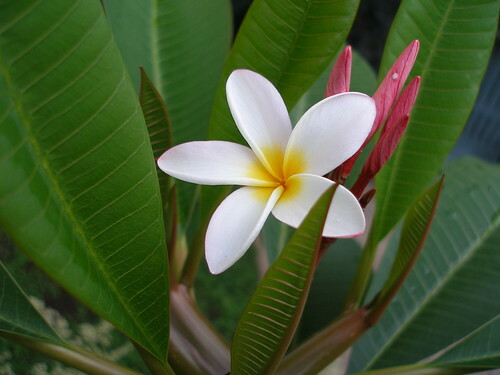 The flower is called ‘Plumeria’, also known as ‘Frangipani’. It is a tree or shrub that can be found in almost all tropical places of the world from Central America to the Philippines or India. I grew my Plumeria from a seed. Seriously, a little tiny seed. Nature never ceases to amaze me. This story starts out about two years ago. I bought a bunch of seeds off ebay. Yes, I know that’s weird, but clearly you can buy anything off ebay. I bought a whole variety of poppy seeds. I really love poppies and I had envisioned a lovely field of poppies in my backyard. None of those seeds ever grew. Not one! So sad. I have had no luck growing poppies and it hurts. Does anyone have any tips for me? Since I was already buying poppy seeds, I thought it would be fun to buy some more obscure flowering plants to try growing. Besides the Plumeria, I also bought Ylang Ylang since that is my favourite scent. I didn’t have any luck with the Ylang Ylang, but I’m encouraged now to try these seeds again. I planted a few Plumeria seeds. Two of them grew into seedlings and then into little plants. Already I was thrilled, but the question was, would they ever flower? I gave one of the plants to my dad, who is the ultimate gardener. If anyone could get it to flower, I was sure at least he could. I planted mine into a larger pot and it just kept growing taller and taller. My tree is now about six feet tall. My dad kept his in a very small pot and his is about three feet tall. That is a very good lesson in controlling the size of your plants. My tree grew straight up with no branches and as the tree grows, the lower leaves just drop away. My dad’s has grown a few branches. We both keep the trees outdoors in the summer and indoors in the winter (obviously). We periodically compare notes on each other’s trees anticipating who’s would flower first, if ever. I figured that his was doing better, since I had essentially let mine grow a bit wild and quickly. A couple weeks ago a strange new cluster of red buds appeared at the top of my tree. I really hoped they might end up being flowers. I bet all the rain we’ve been having this year has been a factor. My little tree must have thought it vacationing in the tropics. There are seven more buds to bloom and the scent of the flower is incredible. If you recognize it, it might be because it is traditionally used in leis. Frangipani is also something that I’ve had in baked goods, but I can’t seem to find out exactly what it is. I seem to remember that it might have to do with almonds? Does anyone know for sure? julia – i’m pretty sure i’ve got some extra seeds. if you want, i can give you a couple. it has been pretty easy to care for, it just requires a few years of patience! those flowers are AMAZING. as is the photography. nice!! your right! 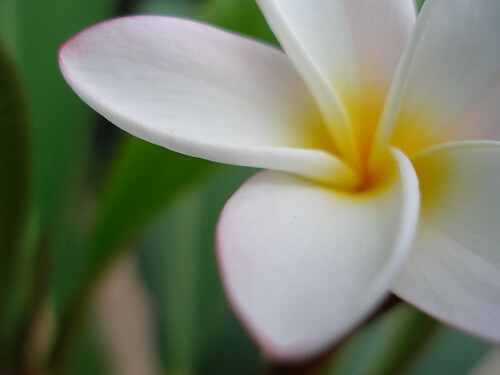 frangipani is that almondy-custardy filling used in tarts, often with fruit. like this one. kimberly – they are amazing and the second one is about to bloom! i’m so curious to see how long the flowers last. thanks for the confirmation, reva. i just like saying the word, ‘frangipani’. and the dessert is pretty yummy. i’ve had a pear tart with frangipani that was delicious. Beautiful and they smell gorgeous don’t they. But don’t eat them! I seem to recall they’re toxic to humans. Pity.